We are excited to announce that we have a new website specifically designed for international students, students studying abroad, and those taking a gap year! The website is called Good International Student Insurance. Did you know that the U.S. hosted over one million international students in 2016? And last year over 300,000 U.S. students studied abroad? These numbers are continually increasing as our world becomes more interconnected. As you are probably aware, the cost of health care in the U.S. is quickly rising. But this is also true for most of the world. The cost of medical care is becoming unaffordable in many countries without insurance. A good international student insurance plan can help prevent you from incurring a large amount of debt, and it doesn’t have to cost very much. We are able to cover international students coming from just about any country in the world as well as U.S. students going to just about any country in the world. All of our plans either meet or exceed F-1/F-2 and J-1/J-2 visa requirements. We want to help you get to wherever you want to go safely. 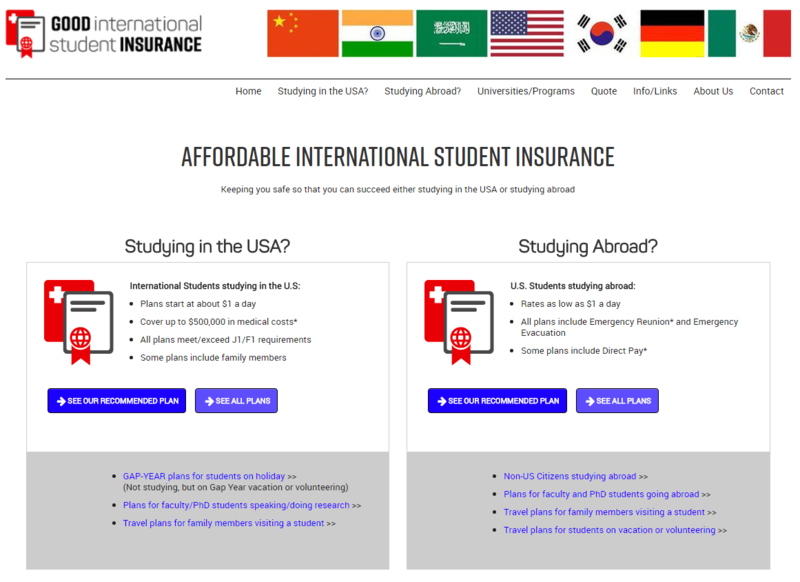 Our Good International Student Insurance site is full of helpful information for international students studying in the U.S. and U.S. students studying abroad. It also has some great information for parents, faculty, family members traveling to visit their student overseas, and for those taking a gap year. Taking a gap year is increasing in popularity, and it is important that you have adequate health insurance during that time. Gap years can be life changing, and they can be a lot of fun, but it is important to be prepared. We have some valuable gap year resources to help prepare you. In addition to that, we also have a blog and resource page with even more helpful information. While some of the leading international student insurance competitors only offer one insurance carrier, we may offer several options depending on the type of policy. That means we can find you the best plan at the best price to meet your specific needs. We also offer plans that have maternity coverage and plans that can cover a spouse, children, or other family members that want to visit. Many universities do not offer this type of coverage, but we can help cover those most important to you – your family. Studying overseas involves making many decisions, and insurance can be complicated, so let us help you find the right policy to meet your needs. Most of our staff has been overseas, and we have been serving international students for 20 years. You can trust us to keep you or your loved one protected during this exciting opportunity.